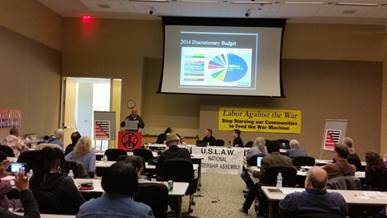 This is the final report of the 2016 USLAW National Assembly, held in Silver Spring, MD, April 15-17. 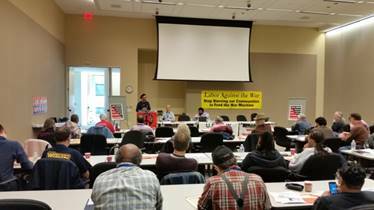 US Labor Against the War (USLAW) held its 2016 National Assembly at ATU’s Tommy Douglas Center in Silver Spring, MD from April 15-17. In addition to being gathered at a time of large scale protest against big money in our political system (Democracy Spring), April 17 was the anniversary of the day in 1965 when the student activist group Students for a Democratic Society (SDS) held its first anti-Vietnam War protest rally in Washington, DC. It was co-sponsored by Women's Strike for Peace. 25,000 attended, including Joan Baez, Judy Collins, and Phil Ochs. History brought us together in more ways than one. USLAW led the campaign to get the AFL-CIO to take a stand against the Iraq war in 2005 (renewed in 2009). It sent the first labor delegation to Iraq and brought Iraqi union leaders to the U.S. in 2005, 2007 and 2009, when it also sent another delegation to Iraq to participate in the first international labor conference ever held there. The labor movement may have shed its Cold War policies but it has not yet shed the organizational and political culture that accompanied those policies. Unlike the labor movements of most countries in the world, with the exception of trade and immigration, most of the American labor leadership still is uncomfortable or has yet to see the importance of talking about foreign policy and the need for international labor solidarity in practice rather than just in rhetoric. This shift in thinking remained a major theme of the weekend and played out in each of the speakers and workshops arranged. Higgins: You were with Mr. Donovan's OSS, weren't you sir? Mr. Wabash: I sailed the Adriatic with a movie star at the helm! It doesn't seem like much of a war now. But it was. I go even further back than that. Ten years after The Great War, as we used to call it. Before we knew enough to number them. Mr. Wabash: Nope. I miss that kind of clarity. Brother Fletcher explained that he thinks we often miss those old clearer days, but they’re not coming back. This 21st Century experience is a wholly different one from the Vietnam War or even the Iraq War, and we need our strategies to reflect that. Fletcher ended with a warning against the growing “revanchism” of the US right—which appeals in particular to people of lower middle income with a longing for national(ist) resurgence as the way back to a lost prosperity—and an appeal for an internationalism in the labor movement that is not limited to trade agreements—and even then only from the perspective of how they affect us here. He said that we need more campaigns like BDS and the new bill to cut military aid to Saudi Arabia. He particularly stressed support for the UN. The UN was set up after WWII to codify the global leadership of the winners of the war, but through internal struggles, less powerful nations transformed the UN into something much more like what it had only pretended to be. Since then, the US has made itself notorious for nullification, consistently vetoing otherwise unanimous or nearly unanimous condemnations of human rights violations by itself and its closest allies. Next, Phyllis Bennis from the Institute for Policy Studies gave us a deeper analytical dive into the wars that have been waged during the last generation, with particular emphasis on the effectiveness of this militaristic approach in comparison to diplomatic efforts in Iran and Cuba. A great example she uses to explore this theme is the classic story of the Syrian trainees that have been all over the news. $500 million was appropriated to train Syrian proxy forces two years ago. 100 fighters were found who satisfied the US’s preconditions. Nearly half defected to ISIS or Al Qaeda, and 54 others defected, left, or were killed. By the time a US general reported to Congress what had become of the half billion-dollar project, he had to admit that only four or five of the proxy fighters remained. We must work harder to end funding sources of ISIS. We should crack down on our allies’ financial support for extremist factions, including Al Qaeda and ISIS. Most analysts agree that a major part of ISIS funding comes from Saudi Arabia; whether it comes from official or unofficial sources, the kingdom certainly has enough control over its population to end the practice. Pressure must also be brought to bear on oil companies and oil traders, especially Turkish middlemen, who traffic in ISIS oil. Bombing oil-truck convoys creates environmental as well as human disasters; we should instead follow the model of the successful campaigns against the purchase of “blood diamonds” from Africa. ISIS would suffer a substantial blow if it could not find buyers for its oil. 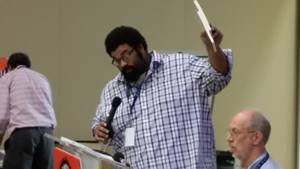 After a break for lunch, there was a report back from Co-convenor John Braxton about the Labor Climate Convergence held by the Labor Network for Sustainability. 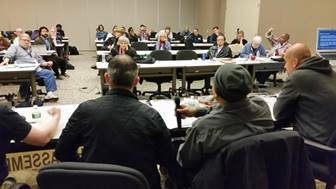 It was a brief report, acknowledging that the connection between labor, global climate change and militarism was present during the Convergence but wasn’t discussed in a significant way. It will be up to USLAW to make sure that militarism’s contribution to climate change is part of the conversation as we move forward. 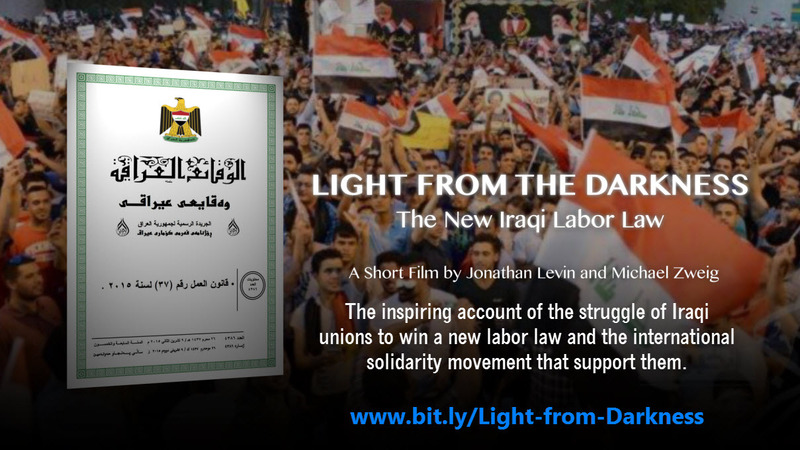 Michael Zweig and Jonathon Levin were up next with the premier presentation of a short documentary video, “Light from the Darkness: The New Iraqi Labor Law”. 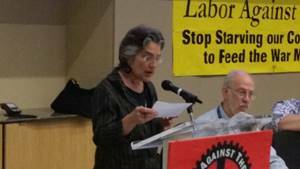 In addition to being a co-convener of USLAW, Zweig is a professor at SUNY Stony Brook, director of the Center for the Study of Working Class Life, and president of the NYC Chapter of USLAW. Levin is a filmmaker who has worked with Zweig previously on “Why Are We in Afghanistan” and “The Iraqi Marshes: Beauty and Civilization in Danger”. The labor law recently passed in Iraq is actually more progressive than our own and is more compliant with international standards than any other labor law in the Middle East or North Africa. Prior to the law’s passage, Iraqi workers and unions were governed by the Saddam-era labor law, which the US kept on the books and the new Iraqi government continued to enforce. USLAW played a key role in getting this new law passed through consistent solidarity work with Iraqi trade unionists. 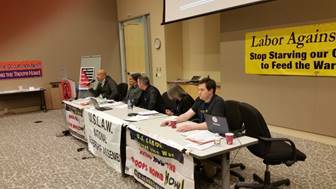 In this country, USLAW, with Solidarity Center, organized a demonstration at the Iraqi embassy in support of a law protecting labor and worked diligently to bring Iraqi labor leaders to the US. In Iraq, USLAW Co-convenor Michael Zweig and former Co-convenor Gene Bruskin were asked by the Iraqi union leaders to co-chair the meeting in Basra which produced a unified statement of the Iraqi labor movement demanding passage of such a law. The new law is definitely a huge victory that should be celebrated, but there is plenty of work still left to do. Public sector employees are still not covered, including state oil company workers, leaving a large portion of the economy not covered by the law. From there, we entered the workshop phase of the agenda. In this section, speakers presented for 45 minutes followed by 15 minutes of Q & A. Afterward, we broke into small groups to discuss what was presented and to figure out what work could be done about what we learned. 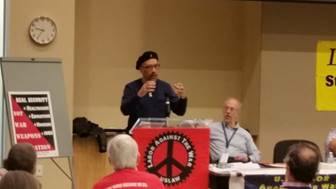 We heard presentations from Iraq Veterans Against War (IVAW,) #blacklivesmatterdmv, and the Washington Peace Center’s co-director Darakshan Raja. The first to present was IVAW. Their focus was on their new #DroptheMIC campaign. - Military spending in 2015 accounted for 54% of US discretionary spending, totaling nearly $600 billion. That figure does not include any funding for veterans’ benefits. - The Pentagon is the largest single employer in the world, maintaining over 800 overt overseas bases and an untold number of covert bases. - Military operations are increasingly being outsourced, and contracting has become a huge industry as a result. - A lot of armaments are sold to the Pentagon – which provides surplus arms of war to an ever-increasingly militarized domestic law enforcement. Arms exporting also greatly enlarges the US military’s footprint on the rest of the globe. - Runaway spending on militarism is promoted in a number of ways. Generals and admirals receive highly lucrative jobs as consultants and lobbyists for arms producers as long as they have had a track record of being supportive. Arms industry positions itself to be able to punish or reward the largest number of elected officials possible with the allocation of jobs. For example, Textron is only one corporation but it produces cluster bombs at 42 different sites in an effort to make constituents stakeholders in perpetuating the work. Finally, to tie this all to labor, the vets used the F22 Raptor program as an example of how this plays out in reality. The F22 is a plane designed solely for dogfighting, something we really don’t do much of in current conflicts. The estimated bill for the F22 was $26.2 billion to produce 182 planes, with the actual cost turning out to be $62 billion. Maintaining the planes for fifteen years, long after they will be obsolete, is projected to cost an additional $59 billion. To make matters worse, the planes are also dangerous to fly because toxic fumes get into the cockpit because of cost cutting on pilot safety features by contractors. Four of them have already crashed. However, 92 of 100 US Senators had part of this project in their state, and the International Association of Machinists sent thousands of workers to lobby for the F22 as if it were a jobs program. 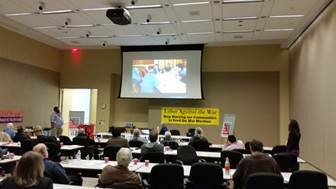 IVAW offered to come to union meetings and do informative presentations for their members. Next, #blacklivesmatterdmv held an intergenerational panel discussion on the relationship between race and imperialism. - Whatever campaigns we support must take care that our rhetoric does not promote or sanction racism, nationalism or antagonism toward immigrants. Transformative relationships are ones that leverage the power of reciprocal relationships to transform spaces and endeavors in ways that improve the freedom, joy, power and self-determination of all parties. - We have to work together in networks of transformative relationships with a shared intention [get free/stop war] and some emerging shared values. Finally, Darakshan Raja, Program Director of the Washington Peace Center, spoke on Islamophobia. - Recognizing that Islamophobia is structural and is a driving form of racism that upholds the War on Terror, surveillance, war, and imperialism. - How to center Muslim communities and directly impacted communities locally and within a transnational context? - What is the role of labor in upholding structural Islamophobia? - How can labor dismantle Islamophobia? What will a movement look like? - Centering Muslim/immigrant workers in their spaces. 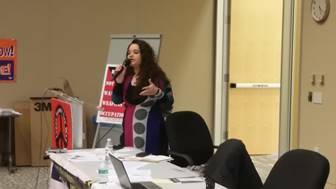 She began with her compelling personal story, describing the deaths of her father and uncle as contributing factors in her developing an interest in Islamophobia. Her father died on the street for lack of medical attention. His brother, her uncle, was arrested and held. Eventually the family learned that he had been sent back to his country of origin to be tortured and later killed. Her mother became the sole parent and bread winner. Beaten and fired, she spent two years unable to find a job. From there, Raja gave us a look at the definition of Islamophobia as it was first created, a term emphasizing personal fear of the unknown. This definition, she told us, ignores the demonization and scapegoating of Muslims and their religion for political purposes. Her more comprehensive definition provides a lens that includes anti-blackness as a critical component of Islamophobia and also emphasizes the structural elements of Islamophobia. An example of the power of Islamophobia domestically that Darakshan pointed to was the National Security Entry-Exit Registration System (NSEERS) program. Originally instituted in September 2002, it was later modified in 2011, then later merged into another program. All male, non-citizen immigrants above the age of 16 from a list of countries, whether entering or already living here, were required to report in person and submit to fingerprinting, photographing and interrogation. The list of countries started as a small list of five, later growing to a list of 25. 24 of the 25 were predominantly Muslim and all of them were in Africa and Asia. Finally, Darakshan challenged unions to be mindful of the effect of the general atmosphere of Islamophobia on their actions as well as their words, and vice versa. She mentioned the incident in a DC public library where a security guard drove a woman out for wearing an hijab, being fired for doing so, and having the union successfully fight to have that decision reversed. After a long day of workshops, breakouts, and speakers we were treated to a performance of labor songs by the U-Liners. Joe Uehlein, leader of the band, graciously bought Assembly attendees rounds for the night. On Sunday, the bulk of what occurred in a half-day session was discussion and adoption of five resolutions. Michael Zweig introduced this resolution calling on members of USLAW to continue to support solidarity work in Iraq, particularly in light of the new labor law. This also means a continued commitment to support the Solidarity Fund used to underwrite this work. John Braxton introduced this resolution. It calls for USLAW to affirm its commitment to a significant reduction in the Pentagon budget and to a rapid transition from fossil fuels to renewable energy, encourage unions at all levels to adopt resolutions supporting just transition toward recued military spending and minimal reliance on fossil fuels, and encourage unions at all levels to support legislation for the just transition described above. Co-conveners of USLAW introduced this resolution. 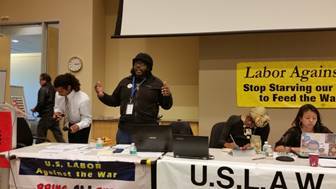 It calls for USLAW to organize a campaign to create a sympathetic relationship between the USLAW and union members who are in the military sector industry on a variety of levels, with the goal of bringing together those connected through these new relationships to discuss ways to move forward together. Marilyn Vogt-Downey introduced this resolution. It calls for USLAW to join a Coalition to stop arming and upholding Saudi Arabia as an ally. Co-conveners of USLAW introduced this resolution. It calls for USLAW to create a diverse committee that will be responsible for developing new strategies and ways of working that speak to the changing nature of our workforce in the 21st Century to make the work of USLAW relevant to a new generation of union members and emerging leaders. Would you recommend Report and Decisions of the 2016 USLAW National Assembly to a friend? Your Review on Report and Decisions of the 2016 USLAW National Assembly has been successfully submitted.